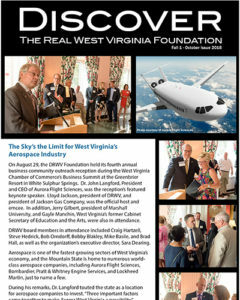 The Foundation has always believed that West Virginia could not only compete, but could win on a global scale, if given the chance. Over the past two decades, partnering with local and state economic development organizations, the Foundation has organized five trade missions to Asia focused on attracting investment, and dozens of reverse trade missions bringing potential investors from around the globe to the Mountain State. 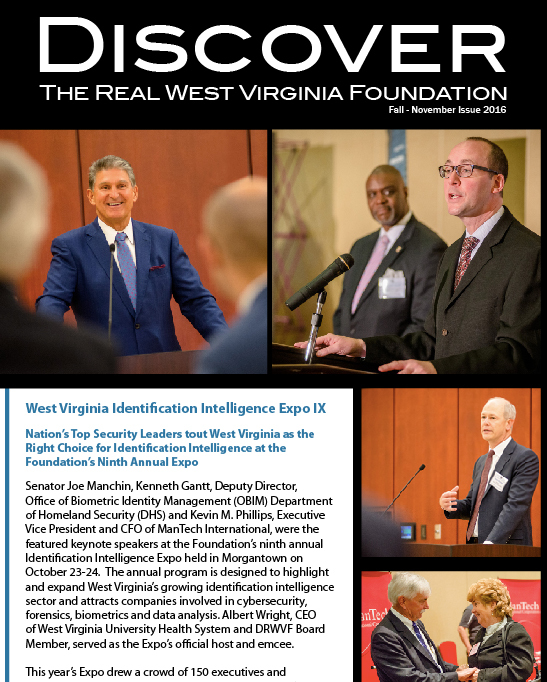 These missions have brought hundreds of industry executives from around the globe into West Virginia, including, among others, the Chairman of NGK Spark Plugs Mfg., and senior level officials with the Toyota Motor Corporation. Early programs also included “Jay Trains”, bringing business leaders from the Washington, DC area via locomotive to the Eastern Panhandle. 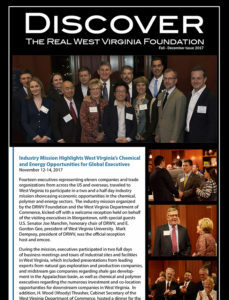 As a result of these trade missions, the DRWV Foundation has played an instrumental role in attracting companies to West Virginia, including: Toyota Motor Manufacturing West Virginia, NGK Spark Plugs (USA), Inc., Diamond Electric, K.S. of West Virginia, Okuno International, Kureha PGA, Nippon Thermostat of America, Hino Motors, and JPN Precision, just to name a few. These companies have invested billions of dollars in investment in the state and created thousands of good paying jobs for our citizens. 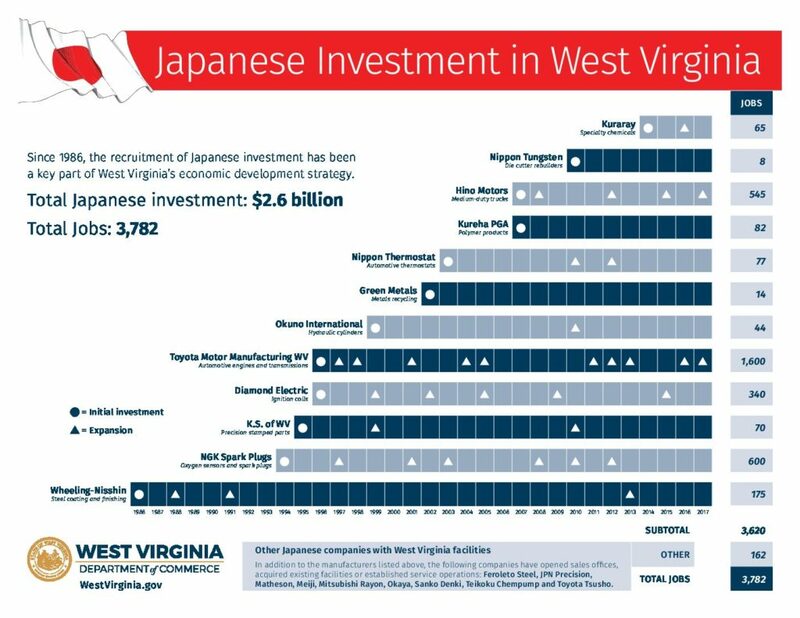 The direct jobs created by the 20 West Virginia-based Japanese companies alone is 3,782, with indirect jobs estimated to be 15,000 plus. These companies have made a significant positive impact on the state’s economy and our local communities. Toyota Motor Manufacturing West Virginia alone, has invested more than $1.5 billion in the state; employs 1,600 team members; has expanded 10 times; and has contributed over $6.4 million in total philanthropy. For a more detailed look at the investment from Japan, please see the Japanese Investment graph. 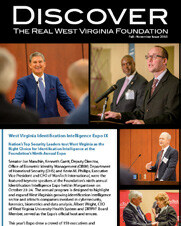 Attracting international investment in industry sectors that offer strategic advantage for the state, including but not limited to, identification intelligence, automotive, chemical and polymer, and the energy, continues to be a mainstay of the organization’s activities and its mission to grow West Virginia’s economy. 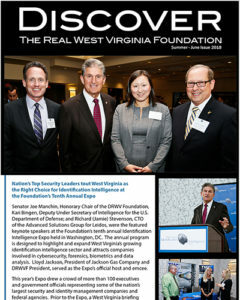 Below you will find a time-line of success with regard to the Foundation’s role in bringing investment and good paying jobs to West Virginia. Hino Announces 250 More Jobs in Wood County (September 2017) Toyota Announces $115 Million Investment in Buffalo (September 2017) TMMWV Celebrates 20 Years and makes $400 million Investment. The plant currently employs 1600 team members. (September 2016) JPN Precision Opens Marketing and Research Office in Charleston. (February 2016) Photo by KENNY KEMP | Gazette-Mail NGK Celebrates 20 Years in WV (September 2015) Diamond Electric Moves US HQ to Putnam County (December 2014) Photo by Steven Wayne Rotsch, Photographer TMMWV Celebrates Production of Buffalo Plant's 10 Millionth Powertrain Unit. (May 2013) Photo by Alex Wilson Photography Nippon Thermostat of America Announces Expansion and 30 more jobs. (August 2012) Hino Announces Additional 2.9 Million Investment and 20 more jobs. (June 2012) TMMWV Announces Seventh Expansion and 80 more Jobs. (March 2012) TMMWV Celebrates 15 Years in the Mountain State (October 2011) Gazette photo by Lawrence Pierce Kureha PGA Grand Opening Celebration in Belle. (September 2011) Photo by Chip Ellis - Charleston Gazette Hino Motors Manufacturing Grand Opening - Williamstown, WV (September 2008) NGK Spark Plugs (USA) Celebrates Plant Expansion - Sissionville, WV (May 2008) Kureha PGA Groundbreaking (April 2008) Kureha Corporation Announces $100 million polymer plant in Belle (December 2007) Hino Motors Announcement. WV Lands First Full-Scale Automotive Assembly Plant (June 2007) NGK Announces Significant Expansion - Sissionville, WV (April 2007) Diamond Electric Expands in Eleanor and Celebrates 10 years in WV (July 2006) TMMWV Celebrates 10 Years in WV (May 2006) K.S. Celebrates 10 Years in the Mountain State (July 2005) NGK Spark Plugs 10th Anniversary Celebration (July 2005) TMMWV's Fifth Expansion brings employment to 1,150. (April 2005) Nippon Thermostat of America's Grand Opening in Putnam County (June 2005) TMMWV Celebrates Fourth Expansion. (April 2004) TMMWV Announces Third Expansion. Buffalo plant is the first plant outside of Japan to make Lexus engines. (January 2001) Okuno International locates in Prichard (September 1999) Photo courtesy of Frank Altizer - The Herald Dispatch TMMWV Announces First and Second Expansions (January/September 1998) Toyota Motor Manufacturing West Virginia (TMMWV) Groundbreaking Ceremony (September 1996) K.S. of West Virginia's Grand Opening (October 1995) NGK Spark Plugs (USA) Opens Facility - Sissionville, WV (July 1995) Wheeling Nisshin Breaks Ground in Follansbee (December 1986) State's first major joint venture with Japan.